That’s not what the turkey revolution was. Apparently “revolution” is a word quickly ascribed to movements in the culinary world as they become relatively mainstream (see: raw food revolution, vegetarian revolution, paleo revolution, Jamie Oliver’s Food Revolution, etc.) before disappearing or being dismissed as ridiculous and /or obnoxious. This is a poor use of the word revolution, but I promise I won’t rant this time around. To be a member of the turkey revolution, apparently all I needed to do was replace other meats with turkey in an effort to reduce both the caloric value and overall flavor of the food I was making (the latter was an unintended consequence). I forged ahead, tryptophan and all, replacing the beef in burgers and meatballs with this low-fat poultry. My first attempt at a burger (ground turkey with nothing mixed in) turned into a sad, gray, mushy puck, and my first meatballs will not be spoken of. But I pressed on, like those revolutionary turkeys fighting amongst the cages of their captive brothers, and created recipes to stand the test of time and – more importantly – my tastebuds. My more recent iterations have been more successful. I have a delicious recipe for turkey burgers which features my salsa slaw, and I’ve even made stuffed turkey patties over fresh, homemade pasta. 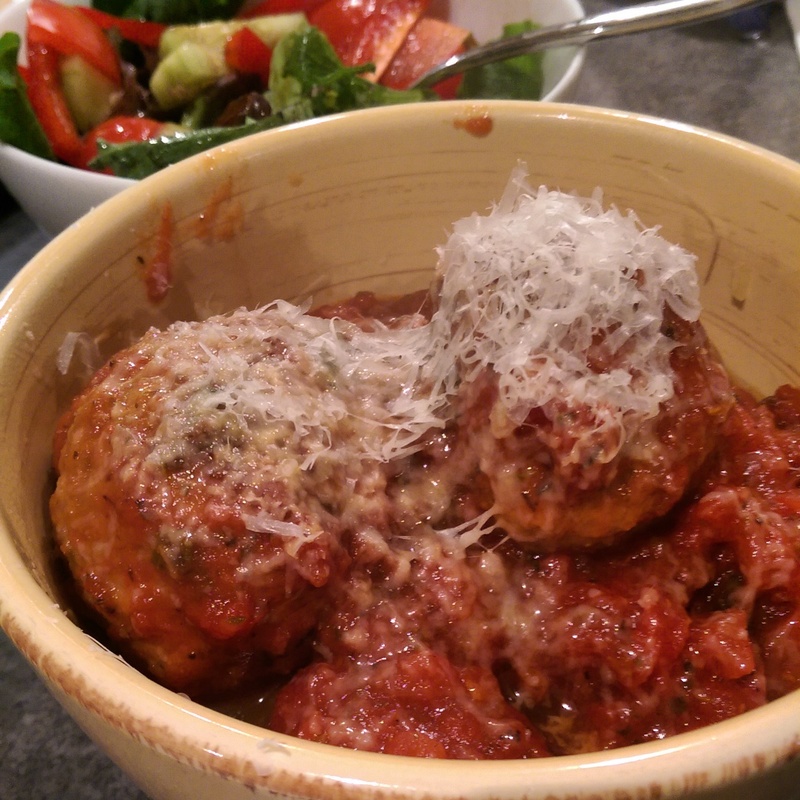 Recently, I came up with the following recipe for “bird balls”, or meatballs made of ground turkey and italian-style chicken sausage. They’re baked, not fried, so they’re relatively healthy, and still pack a flavorful punch. They’re also very simple to make. Combine all ingredients in a large bowl, and fold them together until well-combined. Form the mixture into 1 1/2 to 2-inch balls, rolling between your palms. Place the bird balls on a cookie sheet, spaced a few inches apart, and bake them for 25 mintues, turning once after about 15 minutes. Remove the balls from the oven, adn enjoy! At this point, I like to place them in whatever sauce I’m making, which I like to cook them in before serving them over pasta or (if I’m being healthy) spaghetti squash. What a great idea to flavor the rather bland taste of ground turkey by pairing it with chicken sausage. For sure, it’s one of our favorites! I love food and beer! Hello, and welcome to my blog! I'm a high school teacher from the Seattle area who has a passion for food, drink and life. Thanks for stopping by!